In order to give a personal loan to an acquaintance or give your personal guarantee for someone, it is essential that you have a personal agreement form. The personal agreement form will state the terms of the agreement along with other relevant information. To make it easy for you. We have a wide range of personal agreement forms to choose from. 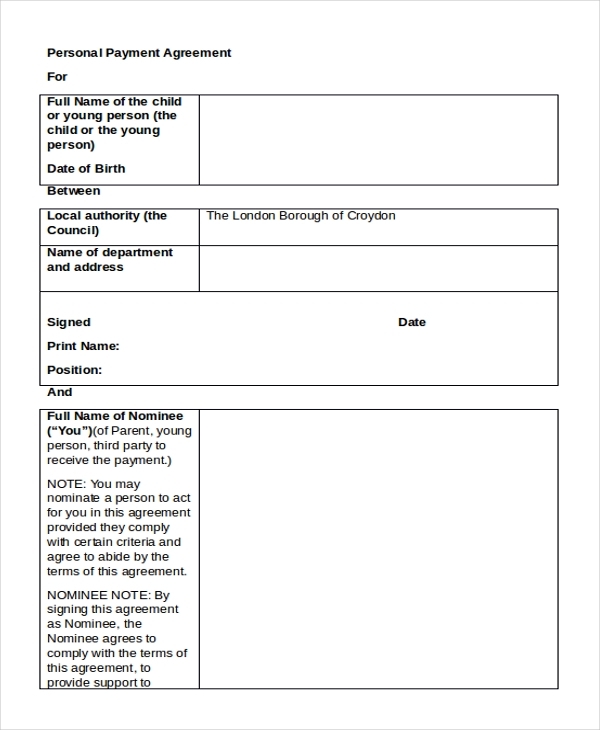 These Agreement Forms are easy to download, can be edited and are also available in a variety of formats. The personal agreement loan is available in Word format. The user can fill in details of the terms of the agreement, the amount of loan taken and other relevant data. This template is easily editable. You may also see Non-Disclosure Agreement Sample Forms. The personal guaranty agreement is available in PDF format. The user can add details about the obligation guaranteed, waiver and consent, enforcement, expenses of enforcement, the obligation of guarantor and other relevant information. 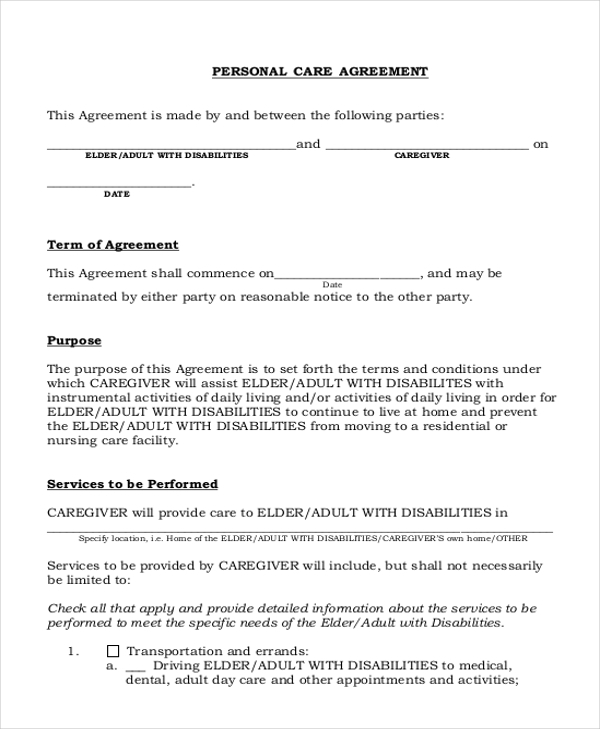 Care providers of the elderly and aged can use the personal care agreement. This template is available in PDF format. Details of the elder’s health, disabilities, and other important information can be added to this agreement. 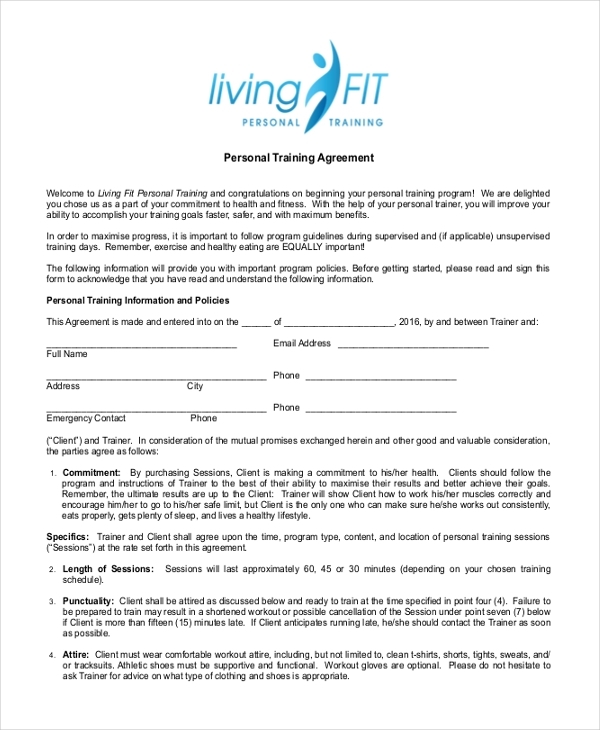 The personal training agreement form is available in PDF format. This form is ideal for personal trainers who are taking on new clients. The details and terms of the agreement such as commitment, the length of sessions and other information can be added to this form. You can also see Sample Partnership Agreement Forms. 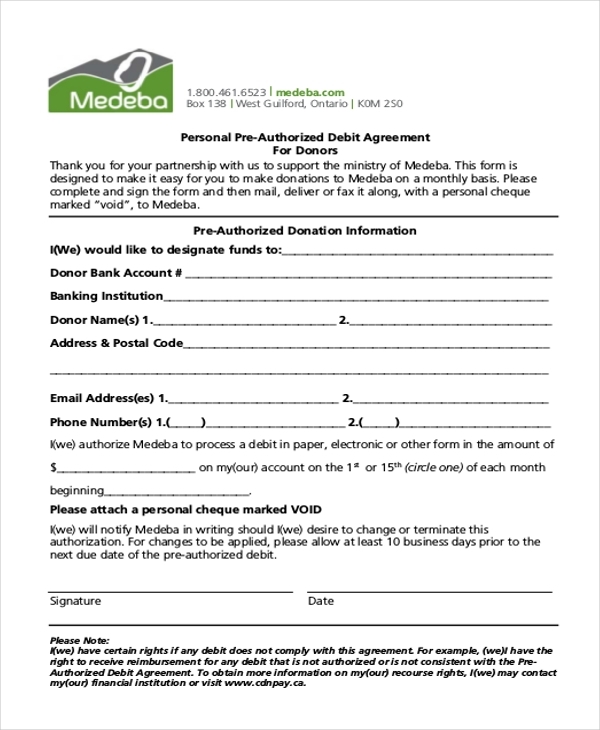 The personal payment agreement is available in Word format and is easily editable. 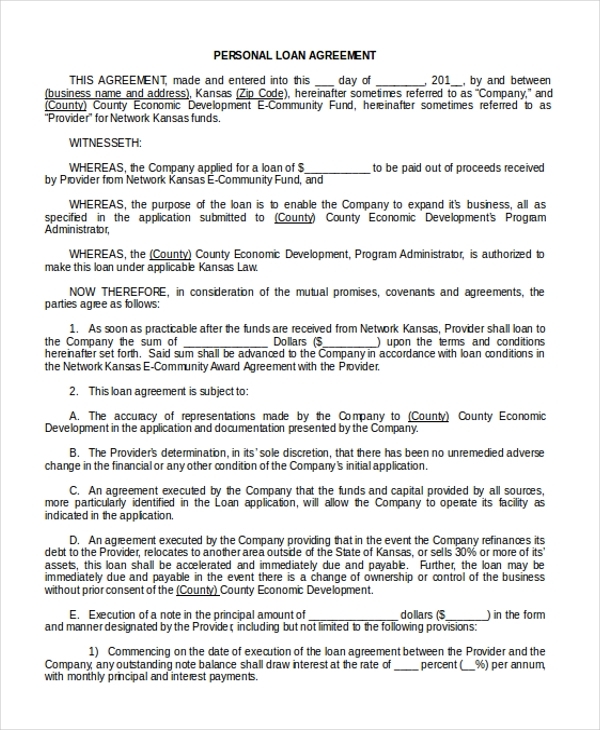 This template has space for the user to fill in details of the agreement, details of the local authority with whom the agreement is being signed and other important information. 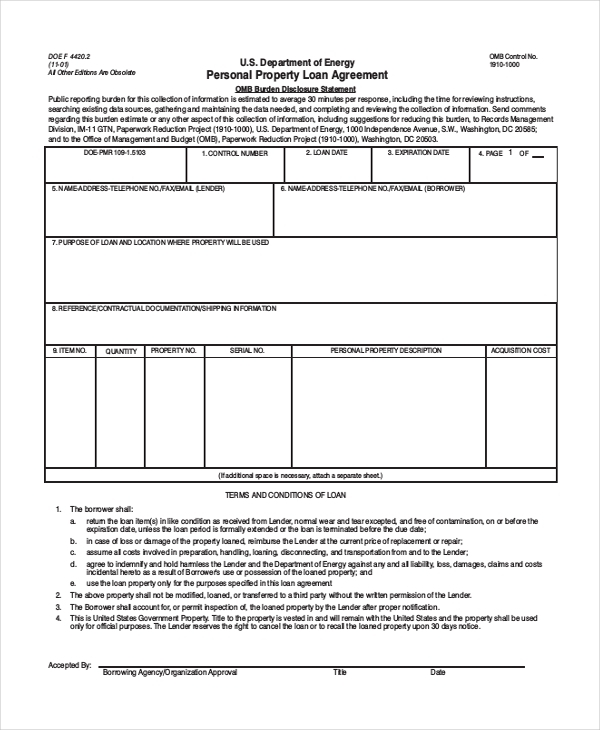 The personal property loan agreement form is available in PDF format. This form has details of the personal property, acquisition cost of the property, loan date, expiry date, purpose of the loan and where the property will be used and other relevant data. The personal service agreement is available in PDF format. Details of the complete description of service, cost and schedule of payments, contract period and other important information can be added to this form. You may also see Sales Agreement Forms. The personal training client agreement is available in Word format and can be edited easily to suit the agreement terms of the user. Typically this agreement is best suited for gym trainers who are providing personal training sessions. 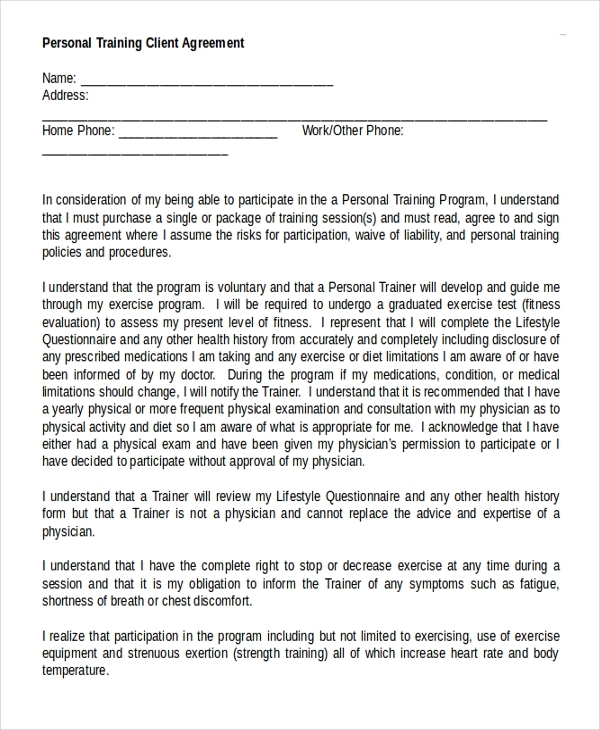 The personal best fitness agreement form is available in PDF format. Details of the training rates of groups and individuals, commitment details, and other relevant information can be added to this template. The personal pre-authorized debit agreement for donors has details of the donor’s bank account, information about the banking institution, donor information, and other vital data. This template is available in PDF format. Who is Target Audience For The Personal Agreement Forms? Typically anyone and everyone who needs to sign and commit to some sort of personal agreement can use the personal agreement forms. People giving out personal loans, gym trainers, personal fitness trainers, service providers, guarantee givers and various others will find these templates extremely useful and handy. If you’re looking to safeguard yourself before committing to some sort of personal agreement, these personal agreement forms are just what you need. 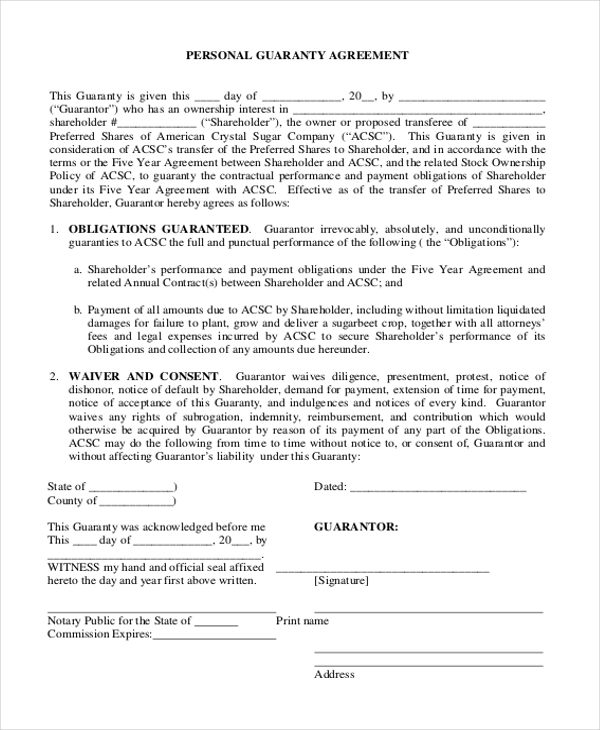 They will clarify the terms of the agreement and you can even add your very own non-disclosure agreement forms in PDF to these templates to further protect and safeguard your interests. 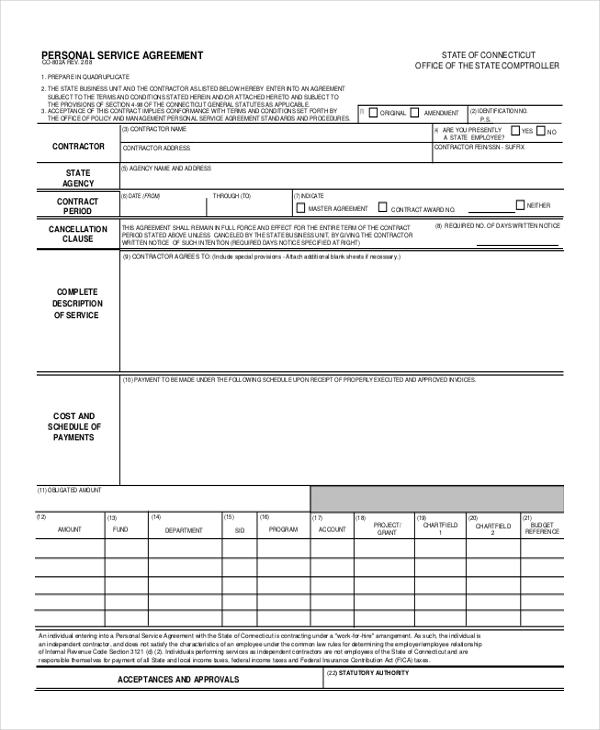 You may also see Rent Agreement Forms. What Are The Benefits Of Using The Personal Agreement Forms? The personal agreement forms are extremely handy and beneficial for various reasons. First and foremost these forms are absolutely free of cost. The user need not waste money on hiring a lawyer to draft or draw up these forms from scratch. Another reason that these forms are beneficial is because they can be saved and used and re-used as per the requirement of the user. The easy edit feature of these forms and templates also make them very convenient for users. Lastly, the personal agreement forms are beneficial because of their convenient and universally accepted formats, making them accessible to all kinds of operating systems including smartphones and tablets. You can also see Purchase and Sale Agreement Forms. So, if you’re looking to draw up a personal agreement with a client or friend, you have come to the right place. Just select an agreement to form the above-mentioned list that best fits your requirement, download it, edit it and print it out. We guarantee that you will find these templates extremely useful and handy.